Briggs of Burton were honored to take part in such an exciting and challenging project and look forward to sampling some of spirit laid down by the Bently Heritage (BH) team in the future. 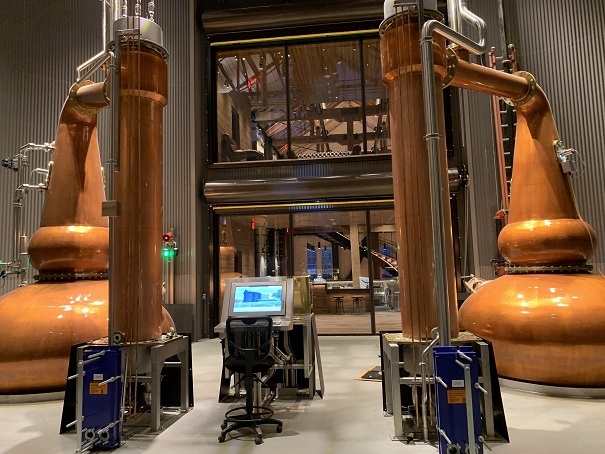 Briggs of Burton have worked closely with BH, Haskell, Miles Construction & Van Woert Bigotti on the architect, civils, process design and installation services, to transform two historic buildings in Minden, Nevada into a modern and fully automated malt and grain distillery. Briggs of Burton’s distilling team are extremely pleased to have supported Christopher Bently and the BH team in bringing Christopher’s dream into reality. Briggs of Burton provided the complete process design for the two distillery processes, the process 3D modelling for pipework and equipment, supply of bespoke mashing process equipment including the Full Lauter Tun, Grain Cooker and an external wash heater for the pot still. In addition to this, Briggs provided a Rockwell control system and the associated process automation for the overall site. This was supported by the onsite Briggs team carrying out the commissioning and training the BH distillers and operators. Briggs of Burton’s in-house engineering teams from Rochester, New York and Burton on Trent, UK, provided innovative solutions to help deliver both the malt and grain production streams with significantly reduced energy usage to assist the BH team achieve LEED Gold status. As part of the project, Briggs of Burton have provided several bespoke equipment designs from their extensive distilling experience. In the Old Flour Mill building that houses the malt distillery, Briggs provided their distillery Lauter Tun, as used by most of the major Scottish malt distilleries. Briggs designed the pot still condensers and designed a wash heater that utilizes an innovative thermal fluid system. In the Creamery building, Briggs provided their distillery cereal grain cooker that allows a range of raw materials including oat, corn and rye to be cooked, for the mix of wooden and stainless washbacks, along with the integration of an initial stripping distillation column and a finishing combined pot column still for the grain spirit production. Briggs of Burton were also responsible for bringing the system into production by providing the complete software and automation for the site supported by the Briggs dedicated commissioning team. Combining two separate production streams including malt and grain spirits production suited Briggs of Burton’s experience of working across the distillation industry. For the Mill, BH will be using the facilities to produce malt whiskey. Notably, the early engineering designs included a traditional direct fire still heating, which due to its energy inefficiency, noise level and space working, was discounted and reworked with a thermal oil heating system that was able to reduce safety hazards, improve efficiency and recreate the character of the older direct fired technology by achieving a similarly high temperature which is not possible with steam. Briggs prides themselves on their Zero Harm policy and in providing health and safety excellence in their designs and in supporting clients in both their production facilities, ensuring best practice. Throughout the project, Briggs of Burton have utilized their well-established distillery engineering tools including intelligent P&IDs and 3D modelling. These helped to define the installation concept and to allow a unified co-ordination of all stakeholders including the BH team, Haskell process installation and Miles Construction civils design work. Designed and built by CRUSH Design.